Photograph by Mogdolna Hargittai, 2002. 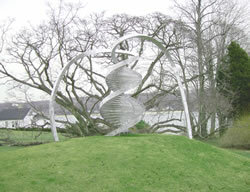 In 2003, the double helix is half a century old! On 25 April 1953, a one-page article appeared in Nature (London), entitled "Molecular Structure of Nucleic Acids: A Structure of Deoxyribonucleic Acid. "1 In it, James Watson (b. 1928) and Francis Crick (b. 1916) suggested a double-helix structure for the substance of heredity, known also as DNA. The brief note was the culmination of a decades-long quest to uncover the chemical identity of the substance responsible for heredity and it was also the beginning of unprecedented growth in molecular biology and the development of biotechnology. A purely diagrammatic figure of elegant simplicity illustrated Watson and Cricks note. It showed the two helices of the molecule that were related by a twofold axis of rotation perpendicular to the common axis of the helices. This symmetry implied that the two helices ran in opposite directions, complementing each other. The paper described how the two helices were held together by purine and pyrimidine bases, joined in pairs, as a single base from one being hydrogenbonded to a single base from the other. A by-nowfamous sentence concluded the note, "It has not escaped our notice that the specific pairing we have postulated immediately suggests a possible copying mechanism for the genetic material." A few weeks later Watson and Crick published a second note, "Genetical Implications of the Structure of Deoxyribonucleic Acid,"2 in which they further elaborated the double helix structure. They described the recipe for self-duplication and stressed the role of hydrogen bonding in the base pairs. Their beautiful diagrammatic figure of the double helix was repeated in the second paper. Heredity has been an intriguing question long before science could have given an answer to its puzzle. In our era of gene technology, it is almost unbelievable that the question regarding the chemical identity of the substance of heredity was first posed in 1928.3 The British pathologist, Frederick Griffith made an important observation: when virulent, encapsulated type III pneumococci were killed and injected together with living, nonencapsulated, thus harmless, type II pneumococciinto laboratory mice, the mice died. Griffith found virulent type III pneumococci in their bodies. One type of bacteria was transformed into another due to the presence of a certain yet unknown chemical substance. Oswald Avery (18771955) at the Rockefeller Institute set out to identify the chemical substance, called by him "the transforming principle." Avery and his co-workers, Colin MacLeod and Maclyn McCarty (b. 1911),4 concluded their long and meticulously documented article with the following statement: "The evidence presented supports the belief that a nucleic acid of the deoxyribose type is the fundamental unit of the transforming principle of Pneumococcus Type III." It was a seminal paper, but it was a long way from this historic discovery to the general recognition of deoxyribonucleic acid as the substance of heredity. The double helix structure of DNA then removed any doubt from its function because the two appeared in such a wonderful unison. The double helix, deservedly, catapulted Watson and Crick to fame, but there were other players who also should be remembered. In addition to Avery and his two associates, there was Sven Furberg (19201983) who uncovered important features of the DNA structure in 1949, such as the bases and the sugar rings being perpendicular to each other. Erwin Chargaff (19052002) determined that while the relative proportions of the various bases differed considerably in the DNAs of different organisms, the relative amounts of different bases followed strict regularities. There was a one-to-one correspondence between certain bases. Rosalind Franklin (19201958) produced X-ray diffraction photographs of DNA that proved its helical structure. While these were crucial contributions, the likes of which would have brought out the DNA structure in time, Watson and Cricks discovery was a masterstroke. They received the Nobel Prize in 1962, sharing it with Maurice Wilkins (b. 1916), who did a comprehensive X-ray crystallographic study of the DNA structure. There is an aspect of this discovery, in our opinion, that the world of chemistry needs to look at carefully. The double helix structure of DNA has been considered a discovery in biology and the Nobel Prize for it was awarded in the category of physiology or medicine. Yet it could be argued that the discovery was a chemical discovery. Suffice it to say that Watson and Crick used Linus Paulings approach of utilizing all relevant previous knowledge about structural chemistry and, in particular, model building of the anticipated structure. The X-ray crystallographic experimental data of Franklin and the analytical chemical (chromatography) findings of Chargaff were all the results of chemistry. One might think that chemistry was forced out of the glory of this great discovery, but this was not the case. Chemistry or, rather, the chemists were not quick enough to recognize the chemical importance of nucleic acids. The wounds chemistry suffered from being left out of this field were self-inflicted. For some time chemists were reluctant to "waste their clean techniques on the dirty mixtures" of nucleic acids as they were viewed by some. It is a moving episode that Albert Eschenmoser, the noted synthetic organic chemist, himself puzzled by this omission of chemistry, prodded the great natural products chemist Vladimir Prelog (19061998) to tell him what he thought about it. Eschenmoser told Prelog: "Vlado, every year during which we did not work on DNA was a wasted year. "5 This was, of course, an exaggeration, but the reality was that chemists did not even include nucleic acids in natural products. This was not only the fate of nucleic acids. As late as 1996, the Nobel laureate Bruce Merrifield, discoverer of chemical synthesis on a solid matrix, complained that "Peptides are certainly natural products, but the classical natural products chemists dont recognize them as such. Peptides are excluded from their repertoire. "5 Merrifield was referring to a recent monograph of natural products chemistry. For some time you have prodded me to tell you, why the great Leopold [Ruzicka] and I did not recognize, in a timely fashion, that the nucleic acids are the most important natural products, and why did we waste our time on such inferior substances as the polyterpenes, steroids, alkaloids, etc. My light-hearted answer was that we considered the nucleic acids as dirty mixtures that we could not and should not investigate with our techniques. Further developments were, at least in part, to justify us. As a matter of fact, for personal and pragmatic reasons, we never considered working on nucleic acids. By now, of course, chemical research on DNA has become strong and widespread, and there is no reason for chemists to consider themselves to any degree lesser participants in celebrating the double helix than the representatives of other fields of science. But it is of interest to look back at the bumpy story of DNA and the double helix and how they found their proper place in the mindset of chemists. We can see signs of ambiguity in the relationship between chemistry and the science of biological macromolecules. One of the most conspicuous signs can be seen in name changes in recent years. For example, the Department of Structural Chemistry has changed its name to Structural Biology at the Weizmann Institute. Less disturbing is when other great institutions, like Harvard University, extend the name of their chemistry departments to be Department of Chemistry and Chemical Biology.
. . . the outstanding charismatic symbol of our timethe spiral staircase leading, I hope, into heavenhas been advertised with a truly remarkable intensity. It has been used as an emblem, it has been put on neckties, it embellishes letterheads, it stands outside of buildings as what might be called commercial sculpture. It has even invaded the higher forms of mannerist art. There is something breathtaking in the double helix structure, whether it is represented by a diagrammatic sketch or an elaborate design. On the campus of Cold Spring Harbor Laboratory, a recently unveiled sculpture has conspicuous simplicity; the two helices are connected with straight rods and at the top the dividing two helices are turned back into the grounda symbolic, but also stabilizing feature. A spectacular, large sculpture stands outside the Biomedical Center of Uppsala University ascending vertically as if from a cell and splitting at the top as if getting ready for reproduction. The discovery of the double helix uncovered one of lifes most fundamental secrets. It has helped improve the quality of life and in this its potentials appear to be boundless, although genetic engineering has a long way to go to achieve general acceptance. The double helix has also created a bridge between science and the arts. 1 J. D. Watson, F.H.C. Crick, Nature 1953, 171, 737-8. 2 J. D. Watson, F.H.C. Crick, Nature 1953, 171, 946-7. 3 I. Hargittai, M. Hargittai, In Our Own Image: Personal Symmetry in Discovery. Kluwer/Plenum, New York, 2000. 4 O. T. Avery, C. MacLeod, M. McCarty, J. Exp. Med. 1944, 79, 137-58. 5 I. Hargittai, Candid Science III: More Conversations with Famous Chemists, Imperial College Press, London, 2003. Balazs Hargittai is at the Chemistry Department of St. Francis University in Loretto, Pennsylvania, his research interest is in peptide chemistry. István Hargittai is at the Budapest University of Technology and Economics. His latest book is Candid Science III: More Conversations with Famous Chemists (Imperial College Press, London, 2003).